Lowland forests of the Mississippi River floodplain and the Minnesota River valley to Le Seuer County. This is a slow growing, medium-sized to large, deciduous tree rising on a single trunk from a usually shallow, widely-spreading root system. It is long lived, often surviving 300 to 350 years. 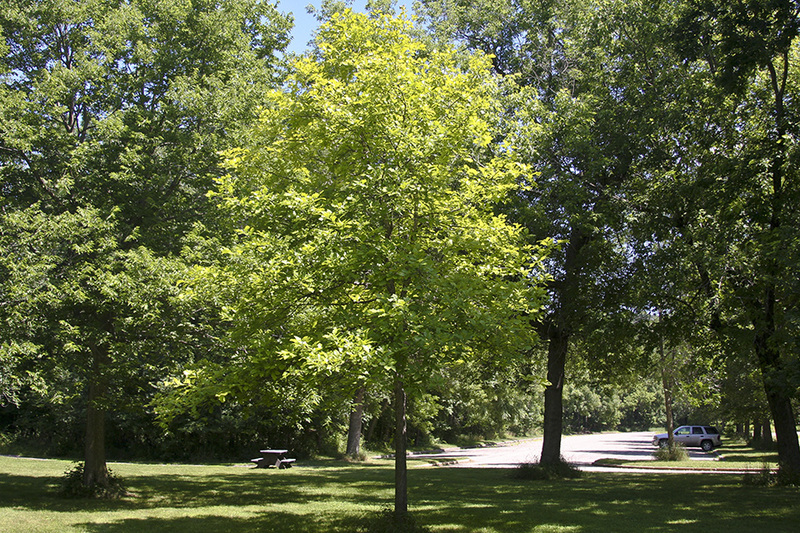 In Minnesota mature trees are usually 50′ to 60′ tall and up to 36″ in diameter, though individuals can reach more than 80′ in height. 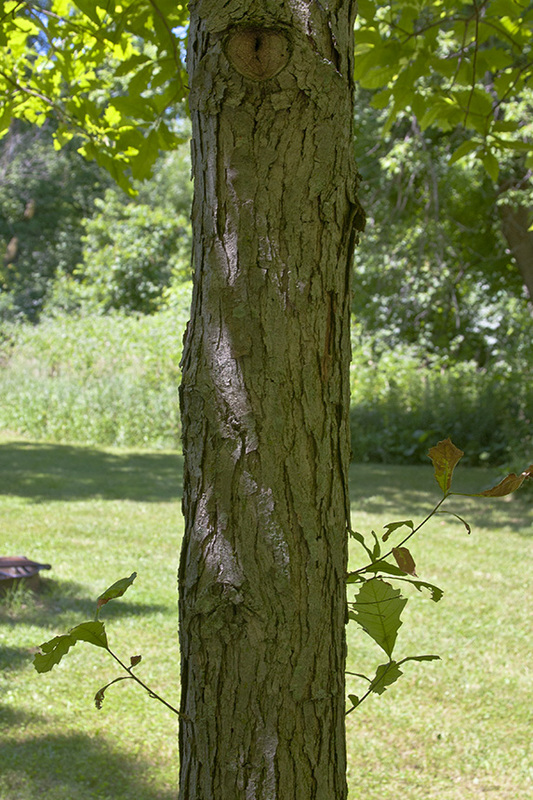 In open areas the the trunk of a mature tree is short and forked, and the crown is irregular, broad, open, and rounded. 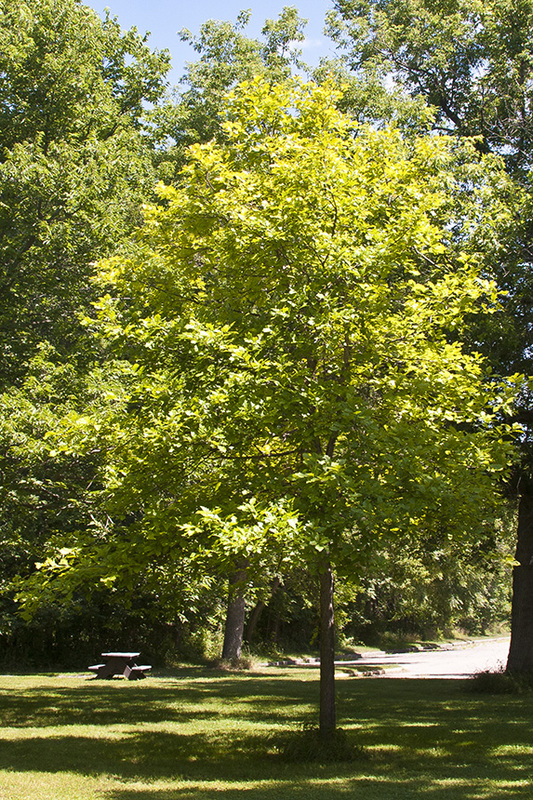 In forested areas the trunk is long and straight, and the crown is narrow, upright, and oval. The upper branches are ascending, the lower ones drooping. 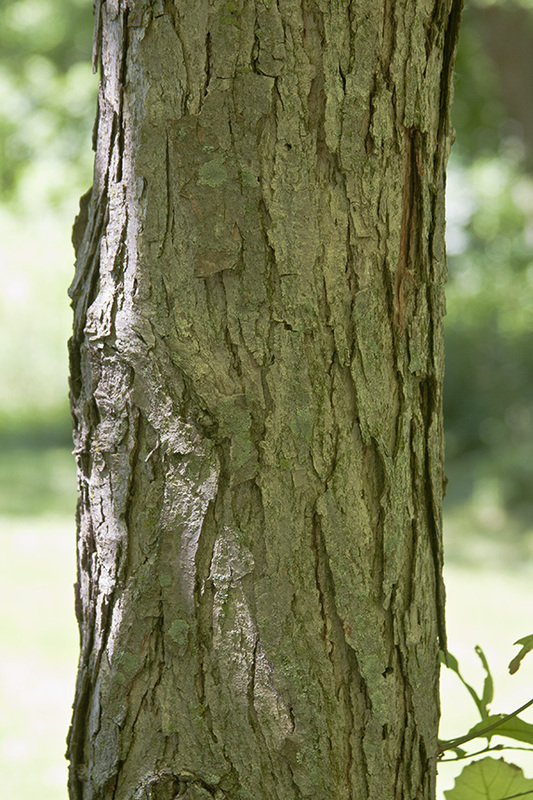 The tree has a shaggy appearance due to persistent, short, crooked, drooping branches on the lower part of the tree and on the larger branches. 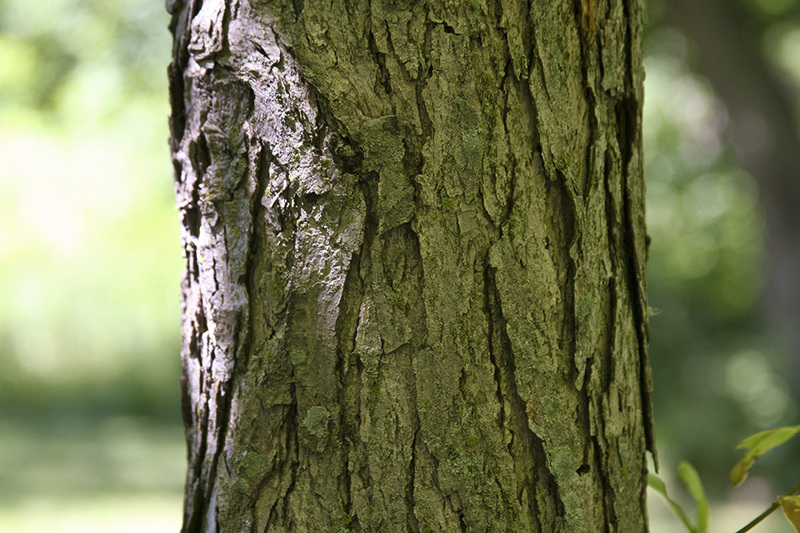 The bark on young trees is light brownish-gray with irregular, thin, loose, vertical strips. 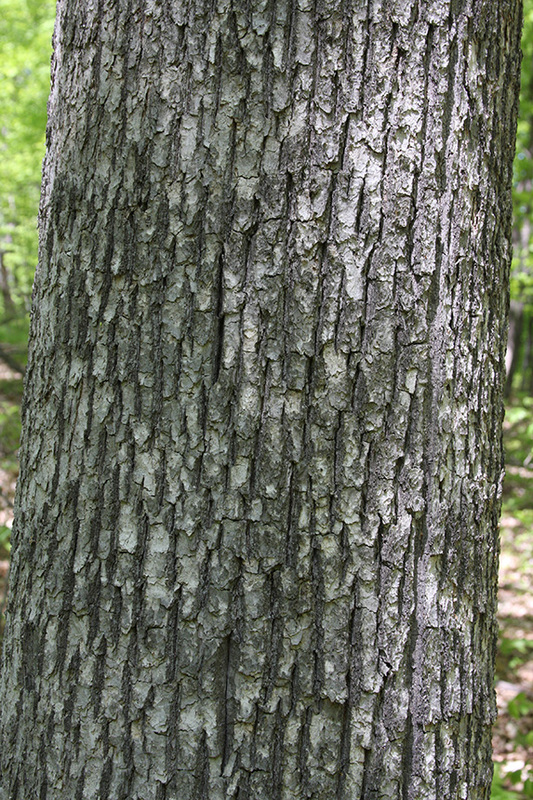 On mature trees the bark is thick and gray or brownish-gray, with narrow, flat-topped, rough, scaly ridges broken horizontally into blocks; and deep, irregular furrows. 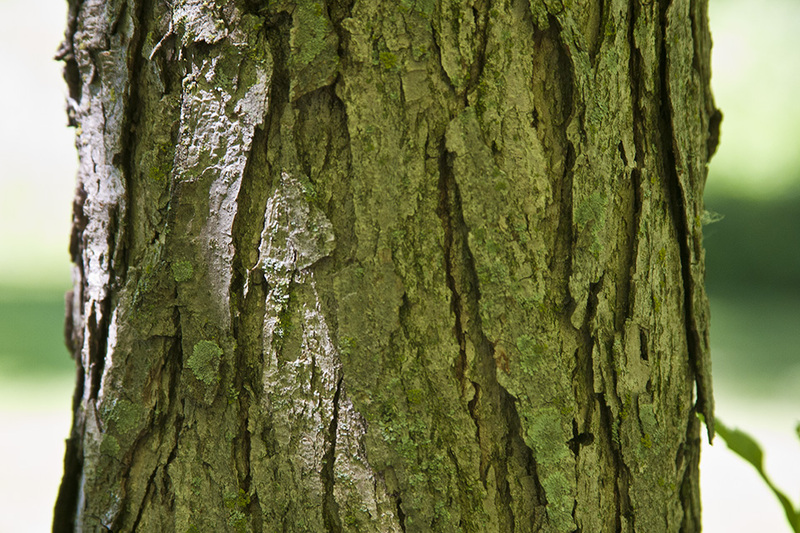 The bark on newer branches of all trees is light brown and ragged, often peeling with irregular, papery scales. The twigs are moderately stout, dull yellowish-brown to reddish-orange, and hairless. Terminal buds are light brown to orangish-brown, hairless, egg-shaped or nearly globe-shaped, blunt, and 1 ⁄16″ to ⅛″ long. They appear in a cluster at the end of the twig. Lateral buds diverge from the twig. There are often thread-like appendages (stipules) around the terminal bud. The leaves are alternate, stiff, and leathery. They are usually inversely egg-shaped in outline, sometimes narrowly elliptic, 4″ to 7″ long, and 2¾″ to 4½″ wide. They are on hairy, light greenish-yellow, 3 ⁄16″ to 1″ long leaf stalks. 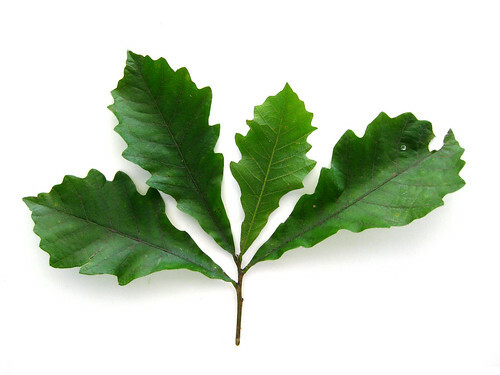 The leaf blade is narrowly wedge-shaped or narrowly angled at the base and rounded at the tip. They have 3 to 9 small to mid-sized, broadly rounded, primary lobes per side separated by narrow, shallow sinuses and usually no secondary lobes. The deepest sinuses extend 15% to 50% of the way to the midrib. There is a prominent midvein with 5 to 7 secondary veins on each side. The secondary veins are arched and end at the tip of a lobe. The veins are light yellow to light green. The upper surface is dark green, glossy, and hairless. The lower surface is velvety to the touch, very pale green or whitish, and dull It is densely covered with minute, flat, appressed, star-shaped (5-rayed) hairs interspersed with longer, erect hairs that have 1 to 4 rays. 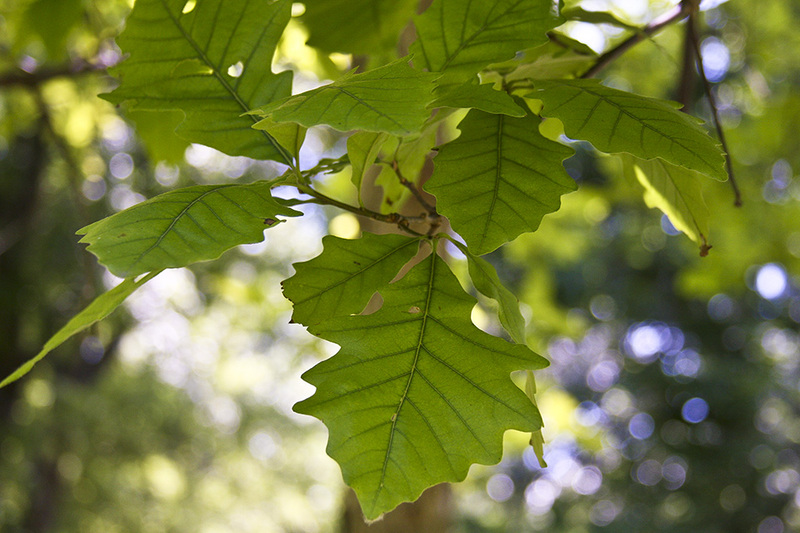 In autumn the leaves turn usually brown or brownish-yellow, sometimes reddish. Male and female flowers are borne separately on the same branch. Male flowers are in slender, greenish, ¾″ to 3⅛″ long catkins that hang downward from buds on branchlets of the previous year. Female flowers are bright green and appear singly or in clusters of 2 or 3 on a short stalk rising from leaf axils on branchlets of the current year. 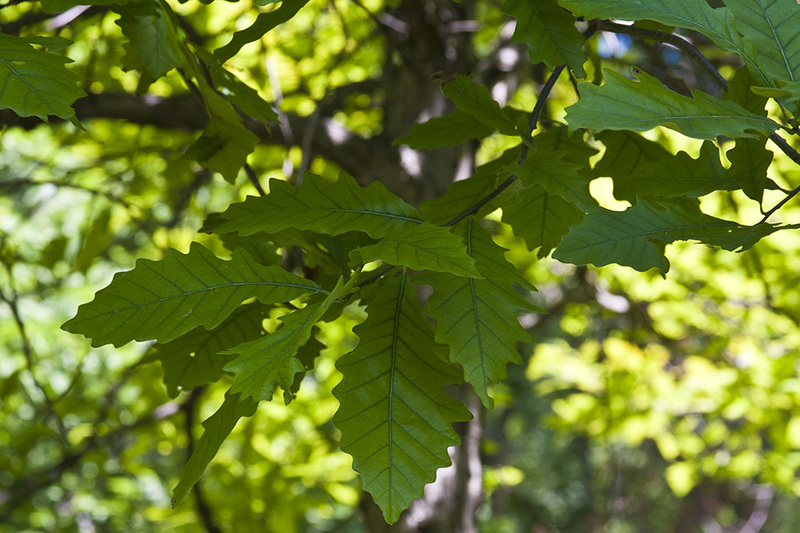 The flowers appear when the leaves are about one-third developed in early to late May. They are pollinated by wind. The fruit is a brown, ellipsoidal or broadly egg-shaped, ⅝″ to 1″ long, ½″ to ⅝″ wide acorn. It occurs usually in pairs, sometimes singly, on a slender, dark brown, 1½″ to 2¾″ long stalk. A scaly, tan or light gray, broadly bowl-shaped, ⅜″ to ⅝″ long, ⅝″ to 1″ wide cup encloses ⅓ to ½ of the lower part of the nut. There is usually a sparse fringe of 1 ⁄32″ long, more or less stiff appendages (awns) around the rim of the cup. The scales on the cup have a prominent, warty bump and the tips of the scales are free and curved backward. The kernel is light brown. It ripens in mid-August to late mid-September of the first year. The kernel is sweet and edible. White oak (Quercus alba) twigs are hairy when young. 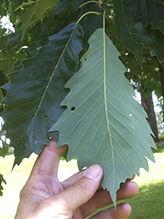 The leaves have 2 or 3 primary and up to 5 secondary lobes. The deepest sinuses extend 50% to 95% of the way to the midrib. The acorn cup encloses no more than ⅓ of the nut. 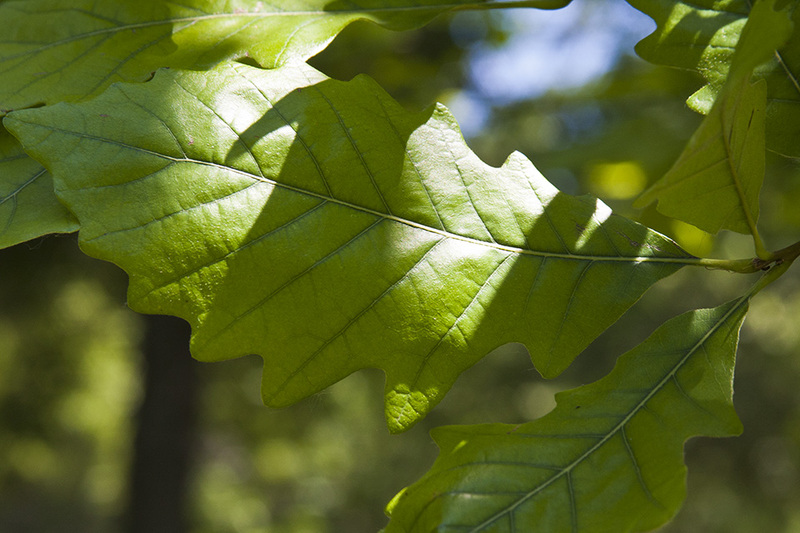 The champion swamp white oak in Minnesota is on private property in or near Braham, in Chisago County. In 2009 it was measured at 60′ tall and of 141″ in circumference (45″ in diameter). Michael Pascoe is the head of the horticulture program at Fanshawe College in London Ontario. He is a wacky plant nut and a great prof. who knows the in's and out's of the horticulture world!